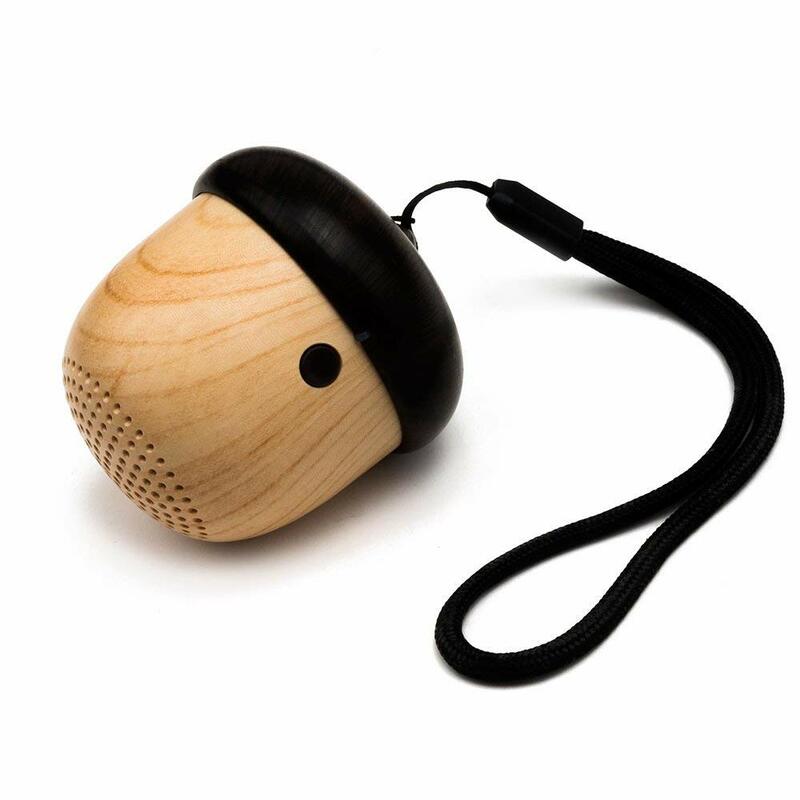 This cute little 2.5oz mini Bluetooth speaker is made from real wood. The tiny nutshell design has a very unique look that makes it stand out from its competitors. It’s very light and easy to carry around. There’s a black sling at the top of the speaker that allows you to hang it just about anywhere you like even on a Christmas tree to entertain friend and family. You get up to 8 hours of playback time with a wireless range of 33 feet. Audio quality is loud and clear, but for less than $15 this tiny speaker is a great option. 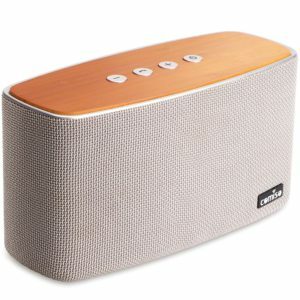 The Mediasonic TEANA SOUND Wooden Bluetooth Speaker features a wooden enclosure that provides minimal sound distortion and improved sound quality. 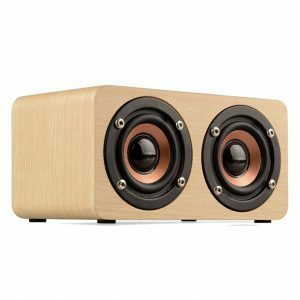 This wooden speaker offers one of the best audio experience of any speaker under $100. You get strong clear mids with crisps high and rich deep bass. When fully charged, you can expect 7-8 hours of playtime at 50% volume. Mediasonic also offers a 2-year warranty for each purchase. 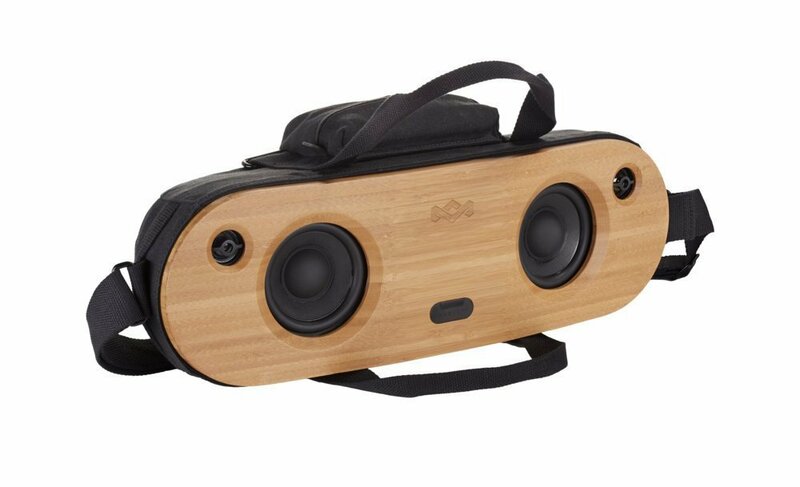 This beautifully designed speaker is a great travel companion for those looking for something a bit bigger than the rugged No Bound speaker. It sports two 8W full range active drivers and two passive bass radiators which produce excellent mids and highs with deep rich bass. 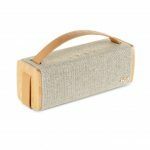 This AOmais LIFE 30W Bluetooth speaker has a similar design to the larger and more expensive House Of Marley Get Together BT Bluetooth speaker above and its also made from natural bamboo and eco-friendly organic fabric. It delivers 10 hours of playtime at 50% volume with close to 50-feet in pairing range. The soundSound quality of the AOMAIS LIFE is pretty good, you get crystal clear trebles and strong punchy bass. You also get 3 EQ modes; classic mode, party mode, and surround mode. This means you have options to enhance your music both indoors and outdoors. AOMAIS has included TWS function which allows you to pair 2 AOMAIS LIFE Bluetooth speakers together to create a 60W surround sound system and if your smartphone is low on power this awesome speaker has a built-in power bank that will easily charge your phone. 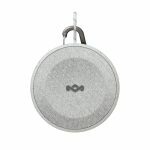 The House Of Marley Chant Mini is a kool little speaker that punches above its weight. Its IPX4 splash resistant so its perfect for outdoor adventures like going to the beach or chilling poolside. Sound quality is very clean and clear with crisp highs and mids. There’s also a built-in microphone for taking phone calls. All House of Marley products is made from recycled material. The Soundfreaq Sound Rise Wood Wireless Bluetooth Speaker is a very handy speaker to have on your bedside table. 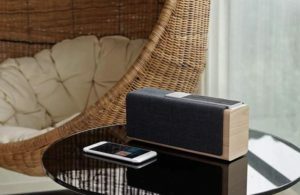 This feature-filled Bluetooth speaker has a built-in smart clock and FM radio so you’re able to set the alarm clock to wake you with music, radio or chime. Additionally, it has a USB charging port to charge your mobile device whenever you need to. With award winner sound quality you get an excellent audio experience with crystal clear vocal and ample bass. The Soundfreaq Sound Rise Wood Wireless Bluetooth Speaker is a bit older than most of the other wood speakers on this list but its an excellent bedside speaker. This beautifully crafted Bluetooth speaker will blend in with the texture of the wood furniture in your home. The Comiso 30W delivers an impressive 20-hours of playback time if you play at middle-level volume with a wireless range of 66-feet. The dual 15W drivers great sound quality awesome clarity between mids and high with deep rich bass. The Comiso 30W is great for the person that wants a small amount of wood accent on their speaker instead of a full wood enclosed device. The House Of Marley Get Together BT Bluetooth front and back panels are made from natural bamboo as well as natural fabric called REWIND. The REWIND fabric is made from recycled plastic water bottles, hemp, and organic cotton. 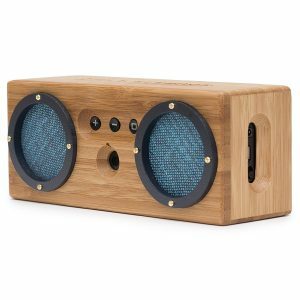 Not only is this a kool and environmentally friendly speaker, but it also sounds awesome with its room-filling 3½-inch high output woofers and 1-inch tweeters for crisp clear highs. 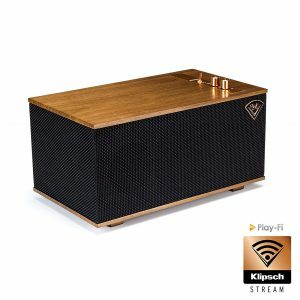 The Klipsch Heritage Wireless Three is made from beautiful luxury materials such as real wood veneer and tactile spun copper switches and knobs mixed with modern technology. 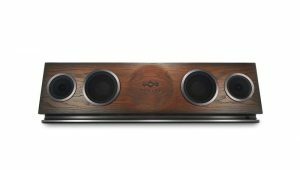 This retro wood Bluetooth speaker features 3 speakers, a pair 2 ¼-inch full range drivers and a 5.25-inch long-throw woofer that’s tuned by Klipsch acousticians to deliver the best audio experience. You can use the Klipsch app to connect your Klipsch Stream Wireless Multi-Room Audio System. This allows you to connect multiple Klipsch speakers around your house wirelessly via a WiFi connection to play your music in various rooms around the house, as long as they are a Klipsch Stream Wireless Multi-Room Audio products. 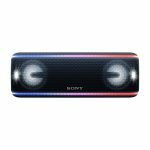 This amazing speaker delivers a special warm full sound experience with excellent bass depth. This audio experience is hands down of the best on the market. This is a fantastic little wood speaker is by far one of the best on the market. 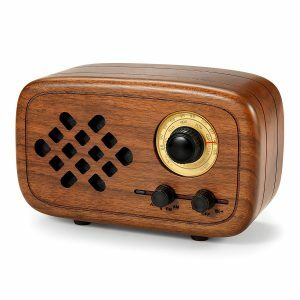 The entire body of this beautiful device has been handcrafted from natural walnut wood to produce that classic vintage radio look and feel. Sound quality very impressive for its size, its powerful enough to fill a large room or office with very clean and clear mids and highs with well-balanced bass. 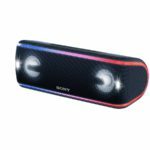 But what makes this Bluetooth speaker different from most on this list it that it’s also an AM/ FM radio, so you’re able to tune and listen to your favorite radio stations. You get up to 15 hours of playback time which is pretty go for the price, with a standby time of 1 Month. 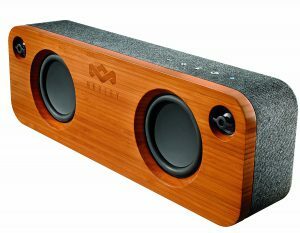 The Rerii Walnut wood portable Bluetooth speakers vintage look will match seamlessly with the textures of the wood furniture around your house. 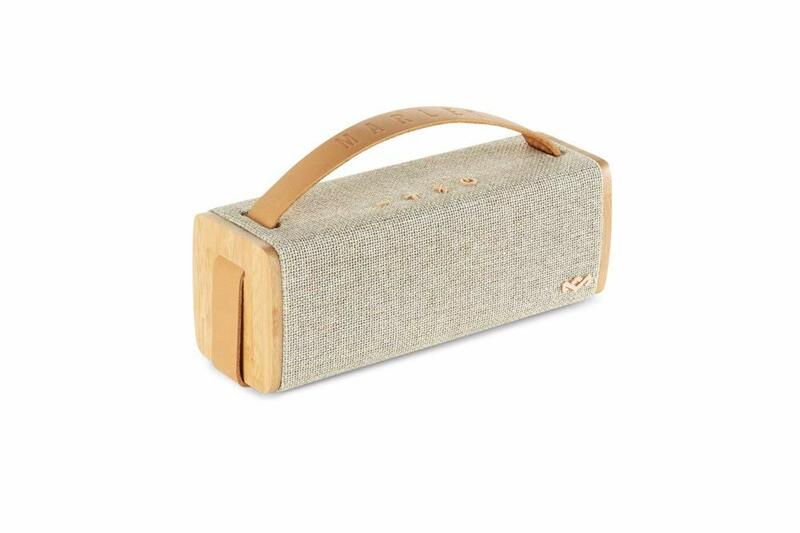 This beautiful little speaker is made from bamboo. It has Bluetooth 4.0 with AptX codec giving you a clear connection. You get 8 hours of playback time with 30 feet of wireless connection. It has vintage linen speaker cloth that makes it stand out and gives it a very unique look. 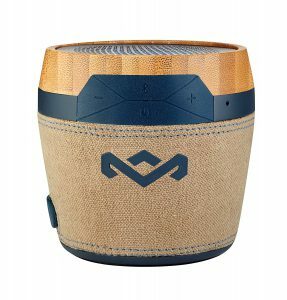 The Bongo is highly customizable so you’re able to choose the colors of the shell, the rings, and the speaker cloth. Sound quality is pretty good, it produces highs that are very crisp without being sharp. This handcrafted 3-inch tall speaker is one of the best-looking speakers on the market, it packs a punch. 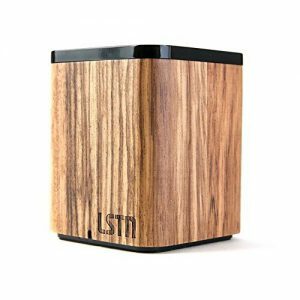 LSTN makes their products from sustainable reclaimed wood and with every purchase, LSTN restores hearing to one person in a 3rd world country. The sound quality is very impressive considering its small package. It will compete with much bigger and more expensive speakers and its electro-acoustically tuned to deliver great quality at any volume. You get 10 hours of playback time which is good enough to power you through the day. The built-in microphone allows you to do voice recordings and take phone calls during playback. 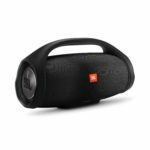 Edifier is known for their great sound systems and the Edifier 1200BT Studies Bluetooth is no exception. 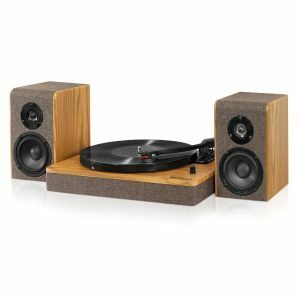 The R1700BT is a pair of versatile speakers with high-quality MDF wood build finish with walnut effect vinyl. What makes the RC700BT so versatile is its ability to connect to devices via Bluetooth and 2 AUX inputs with a 3.5mm headphone output or dual RCA output. The right speaker has three knobs that allow you to adjust treble, bass, and volume so you can tune the audio to your preference. So quality is amazing the added option to adjust the treble and bass as needed will take your listening experience to another level. 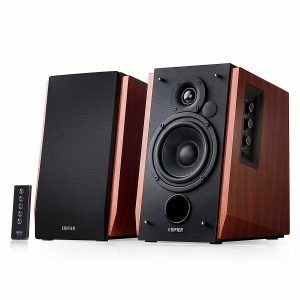 These speakers have excellent high ends that’s very crisp and clear with great bass. There’s also an included remote to control your volume, mute, Bluetooth, and line-in connection. 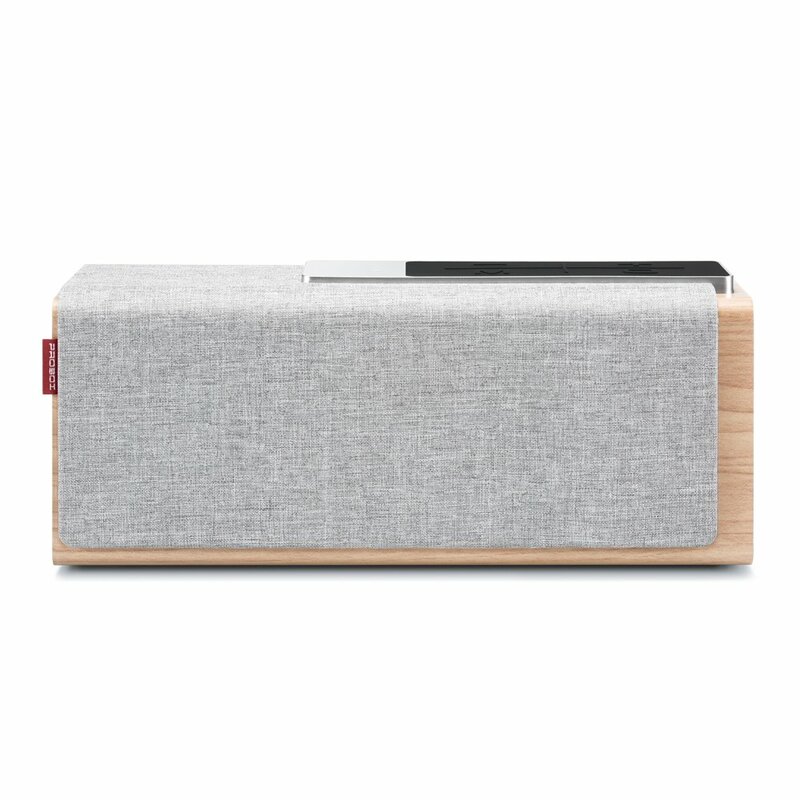 This elegant portable wooden Bluetooth speaker was designed as a homage to the Timber Pedestrian Bridge in the resort town of Anaklia, Georgia with its wood grain and aluminum design. 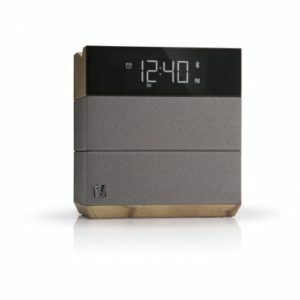 This unique innovative speaker has touch and swipe controls to turn on or off, adjust volume and pair Bluetooth devices. You get a claimed 15 hours of playback time and excellent sound quality from a pair of 2-inch drivers and passive radiators that provides rich and crisp highs and mids. If your looking a unique wood Bluetooth speaker that stands out with its awesome touch and swipe controls the TIC Anaklia Bluetooth speaker is one of the best options. 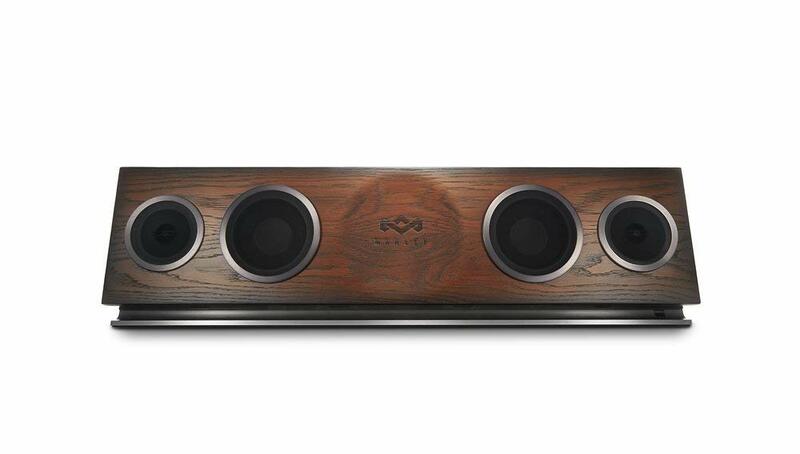 This Speaker isn’t truly made out of wood. It’s made of medium density fiberboard with a yellow wood skin wrapped over it. This might be a bit disappointing for some but this retro looking speaker pumps out some great sound. There’s a TF slot to put your microSD card into to play your music directly from the speaker instead of having to pair the speaker with your phone or tablet through Bluetooth. It has Bluetooth 4.0 and a wireless range of up to 33ft. Considering the price, the sound quality is very good but audio can get a bit distorted when at max volume depending on what you’re listening to. The One Foundation Premium home HiFi system has a very minimalist but classy design. 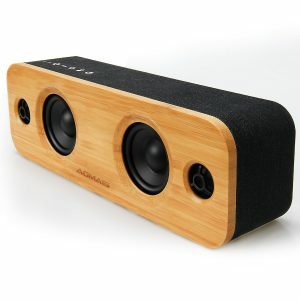 This gorgeous speaker is constructed from renewable Oakwood, aluminum, and plastic. 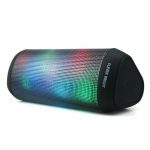 It offers Bluetooth, Optical Digital, and WiFi connectivity so it’s an excellent speaker for your home entertainment. The sound quality is loud and clear with plenty of warmth and rich vocals. It also has a really stylish remote that you can use to control audio playback should you choose. 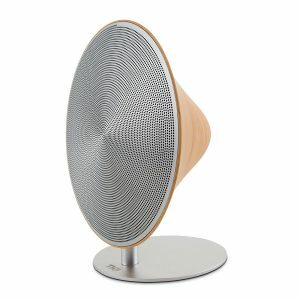 The One Foundation speaker is hands down one of the most beautiful in-home speakers on the market. The Victrola Modern 3-speed Bluetooth turntable is a classic turntable with a modern twist. Its made from oak wood and burlap fabric that gives it that vintage look and feel. The record player has a 3-speed turntable to spin your favorite vinyl recordings to the speed you want. Thanks to Bluetooth technology you will also be able to stream your favorite music wirelessly via your smartphone, tablet or mp3 from a distance of 33-feet. The powerful speakers are very loud with excellent sound quality. The deliver clean clear mids and highs with deep bass. Have your say below if you have purchased any of these awesome Wood Bluetooth Speakers above, please share your experience with us. If you have any questions about these or any other Bluetooth Speakers please comment below. Another for your list is the Rerii handcrafted walnut wood Bluetooth speaker. Unlike most of the speakers listed it is made of solid wood; no veneers or finishes here. It has Bluetooth and also am/FM radio. It is beautifully designed in vintage fashion with excellent build quality. The sound is excellent, warm and has depth. It’s crystal clear in vocals especially. Bass is balanced, not boomy. At 375g with travel bag, it is extremely portable. Lots of 5 star (real) reviews at Amazon and at 60 USD not hard to see why. Hey Craigston. You make a very convincing argument, but I’m already very familiar with the Rerii Bluetooth speaker and will be adding it to this list for sure. It’s a truly awesome device. Thanks for sharing with us, I really appreciate your comment. If anymore more awesome suggestions feel free to comment and share.